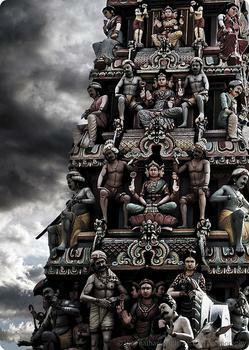 Singapore's oldest and most important Hindu temple and worth a visit for the intricately carved gopuram (statuary above the entrance), which gave adjacent 'Pagoda Street' its name. Singapore's oldest and most important Hindu temple and worth a visit for the intricately carved gopuram (statuary above the entrance), which gave adjacent 'Pagoda Street' its name. This is an active temple, so take off your shoes and don't disturb the worshippers.